Photographer Glenn Charles recently completed a 400-mile solo bike trip through New England, but this trip wasn’t about testing his endurance. The goal was to trace the network of a growing local food system, while making the path from farm to fork visible. The Farm to Table Cycle trip is an awareness campaign organized by the nonprofit Wholesome Wave. Over the course of 16 days, Charles made over 40 stops to photograph farmers markets, sustainable farms, community gardens, and other nonprofits working to improve the food system. The trip started in Bridgeport, Connecticut and ended in Portland, Maine. Wholesome Wave was founded in 2007 to help improve access to fresh foods for low-income families. The organization may be best known for its Double Value Coupon Program, which doubles the value of food stamps when recipients shop at the farmers market. This year, the program works with over 3,500 farms and provides double value coupons to 35,851 people. Ninety percent of the program’s participants say the Double Value Coupons help them eat more fresh fruits and vegetables. Wholesome Wave also created a Fruit and Vegetable Prescription Program, which allows doctors to prescribe fresh produce to families affected by diet-related diseases. One prescription equals at least one additional serving of healthy produce per day for each patient and family member, also to be purchased at a participating farmers market. One of Charles’ stops was at Pat’s Pastured, a farm in Rhode Island that produces pasture- raised and grassfed meats and eggs. Farmer Patrick McNiff was happy to have Charles come to the farm. 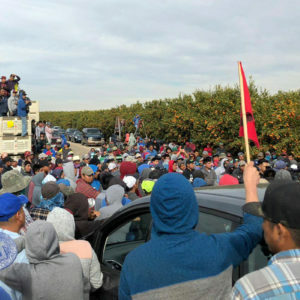 “One of the goals is definitely to highlight the farms and people we work with,” said Wholesome Wave’s Ashley Gaudiano. Several of the stops were at farmers markets that run Wholesome Wave’s nutrition incentives program, which can be found in over 300 markets in 22 states across the U.S. 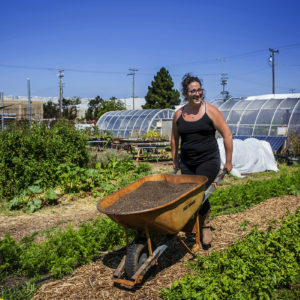 However, the nonprofit also wanted to highlight the larger network of farms, organizations, and businesses working to make local food economies viable. “We were really trying to [capture] as much of a full cycle as we could,” said Gaudiano. 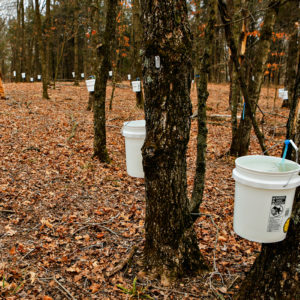 For example, not far from Providence, Rhode Island, Charles made stops at Four Town Farm, a 150-acre fifth-generation farm, and at Indie Growers, a small organic operation that takes up less than an acre. These two farms work with Simone’s, a farm-to-table restaurant in Warren, Rhode Island where the Charles stopped for a meal. The two farms are also involved with Farm Fresh Rhode Island, another nonprofit that hosts farmers markets, wholesale markets, and certified kitchens. To connect the dots, Charles also visited one of Farm Fresh Rhode Island’s farmers markets. Traveling by bike not only earned the trip attention, but it also allowed the journey to unfold at a slower pace, putting Charles in touch with New England’s shifting landscapes. “For me as a photographer, it really helped keep me grounded in what it was that I was trying to photograph,” he said. The trip was not without its challenges, however. A lack of bike infrastructure made navigating some urban areas difficult, and on the first day of the trip Charles blew a tire by hitting a piece of glass. “We were all worried about that setting us back, but everything worked out Okay,” he said. To avoid taking money away from other Wholesome Wave programs, Charles and the organization found sponsors for the trip, which includes Naked Juice, Newman’s Own, Organic Valley, Whole Foods of Fairfield, Connecticut, and Shearwater Coffee Roasters. A number of others offered donated snacks and meals. One of the biggest perks, adds Charles, has been the abundance of fresh food. “It’s the only long distance bicycle trip I’ve been on where I’m coming back weighing more than I did when I started,” he said. See a sampling of Charles’ photos below and visit the project’s website to see the complete set. Wholesome Wave has also partnered with the Westport Arts Center in Connecticut to show the images in their gallery space. Fifth-generation family farmer, Chris Clegg pulls turnips at Four Town Farm, Seekonk, MA. Shoppers spending their SNAP benefits at the Exeter farmers market receive up to $10 to match their EBT purchase. Cassandria Campbell preps food at the Crop Circle Kitchen incubator space for her co-owned food truck, Fresh Food Generation. Adventure traveler and photographer, Glenn Charles, takes a break on New England back roads during the 500 mile Farm to Table Cycle journey. 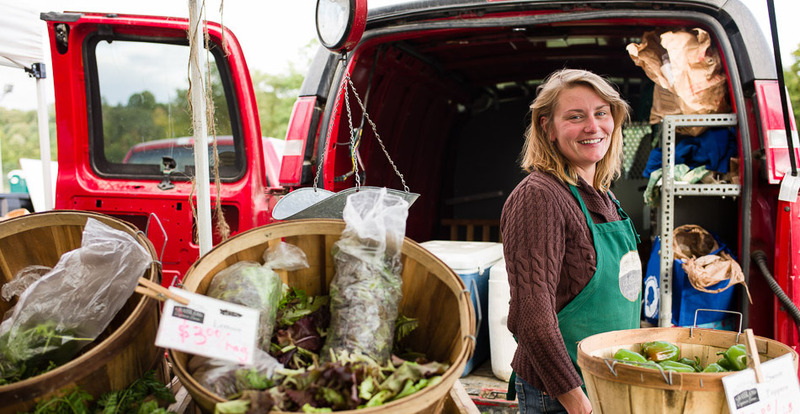 Photo at the top of the page: Sarah Smith, owner of the MOFGA-certified Grassland Organic Farm in Skowhegan, ME, sells her produce at the Augusta Farmers Market at Mill Park.